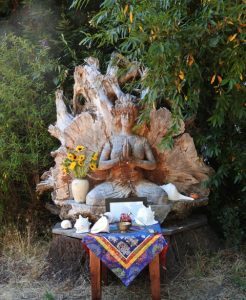 On Sunday July 24th the Back Porch Zendo in Occidental California held a Shuso ceremony. The Shuso ceremony is put on to formally recognize a head monk who has presided over a training period. This training period began last summer having a duration of approximately one year. The Shuso ceremony takes place as an inquiry into the understanding of the participants and the Shuso candidate. In American Zen there are not so many official and beautiful temples as there are in Japan. Use is made of whatever facilities are available that can lend themselves to accommodate practitioners of Zen. In this case the assembly took place out in the forest in a beautiful grove of Redwood trees. The afternoon sun was peeking through the deep shade and a cool breeze kept things wonderfully temperate. This ceremony was held to inaugurate Ken Sawyer who has been practicing Zen sitting since the early 1970’s. Steve Winetraub is the Dharma teacher from Zen Center, Green Gulch Farm who has been working with Ken. 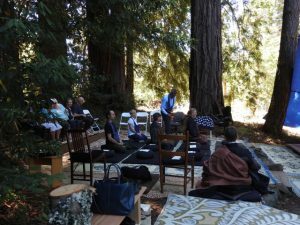 Many people were present who have been part of the Northern California Soto Zen community for years. 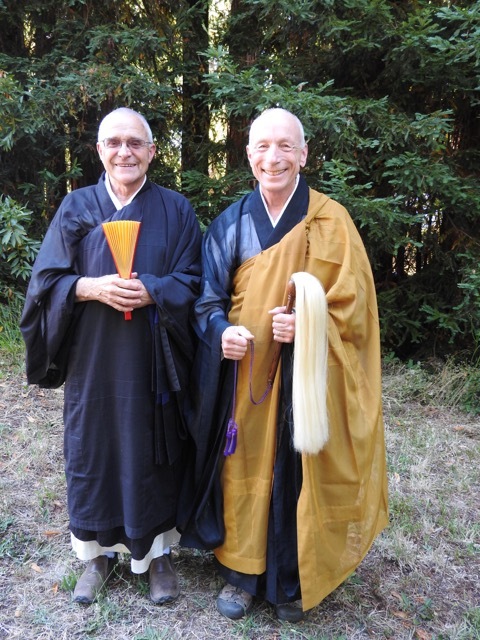 The ceremony features the candidate for Shuso and the Dharma teacher who has prepared the candidate for this position. They have spent up to a year working together honing the skills and discipline necessary to ready the Shuso for this responsibility. The ceremony is a way to formally establish that preparedness. After opening comments that feature an ancient Zen story, the traditional walking staff is presented to the Shuso. After he accepts the staff, all attendees are called upon, one by one, to ask a question of the candidate. Each time a question is answered the Shuso strikes the staff down against the floor signaling readiness for the next question. 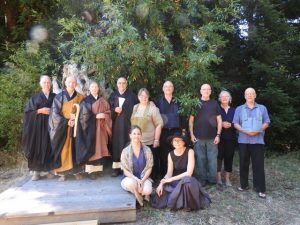 This formal period of questions and answers is called “Mondo” and is sometimes thought to be the transmission of Zen directly from spirit to spirit. When the question and answer period is complete then. one by one, formal statements, usually of congratulations, are bestowed by all attendees upon the new Shuso.